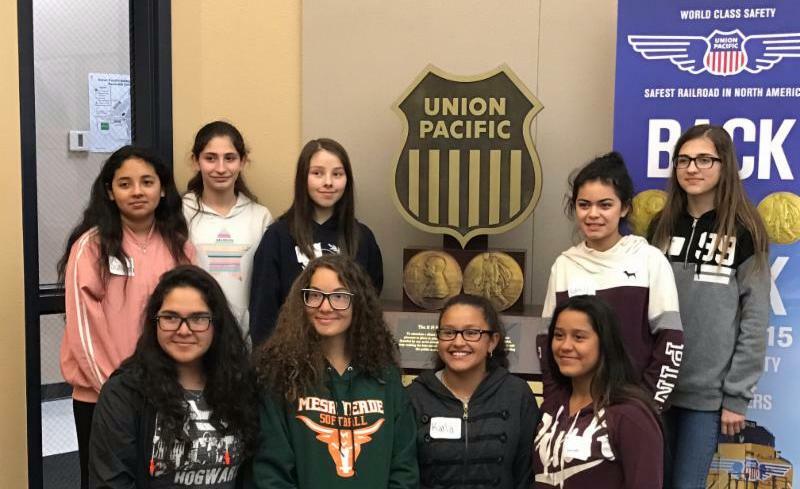 On Friday, April 7th, the Union Pacific Railroad (UPRR) J.R. Davis Yard opened their doors to WTS Transportation YOU and our partnering Sylvan Middle School girls for an amazing tour of their rail facility. We were joined by Nicole Morris, Director of Terminal Operations, Elizabeth Lewis, Senior Recruitment Manager, and other UPPR staff for an eye-opening day at the rail yard. Nicole debriefed the group on the history and current operations of the state-of-the-art facility. The girls got to take a driving tour on a portion of the 915-acre yard that encompasses 50 miles of track that can house up to 6,500 rail cars. We viewed the repair facility and witnessed the workings of the hump yard - a lead track on a gentle slope where the single cars are detached from one another and roll by gravity on the tracks to be sorted. The guided tour allowed the girls to view all realms of the railroad facility, including behind the scenes operations of the incoming and outgoing trains. One of the highlights of the day was the train simulator where locomotive engineers are trained and continuously tested to operate the locomotives. Each girl was given the opportunity to sit in the hot seat and take the throttle on a simulated run in various weather and loading conditions... stopping a heavy train can take great lengths of time and distance! The enthusiasm of those involved in the tour was quite contagious for our Middle Schoolers. They were introduced to an abundance of job opportunities within the railroad field that could potentially take them across the nation in a career that they had never heard of before this tour. Quite a day in the books for these girls indeed. Thank you to all the J.R. Davis Yard staff for allowing our girls to tour the most modern western region railroad yard! 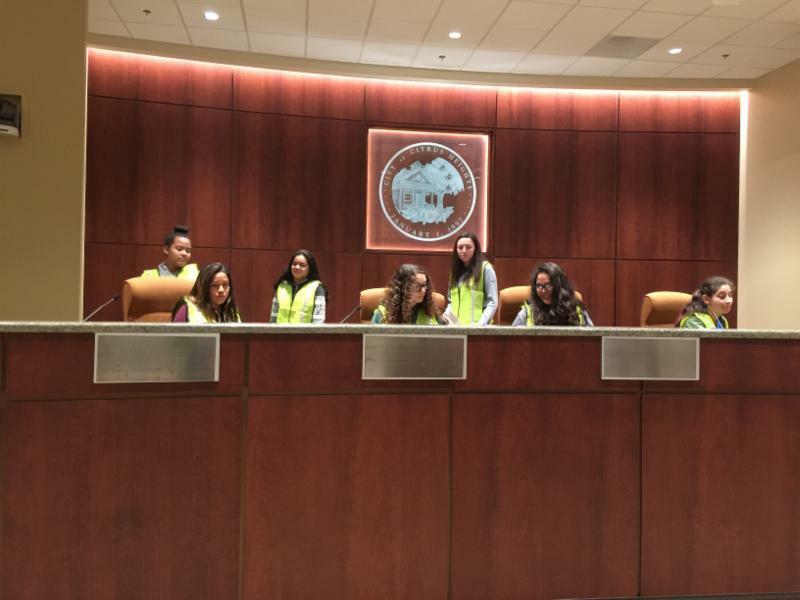 On February 1st, Julie Passalacqua and Meggie Elledge were joined by 9 Sylvan Middle School ladies to take a closer look at their City of Citrus Heights surroundings. Sylvan Middle School relocated to a new campus this past school year and amongst all the positive outcomes that came with the move, unfortunately the current traffic conditions have posed new issues with congestion and safety for the students and the city. 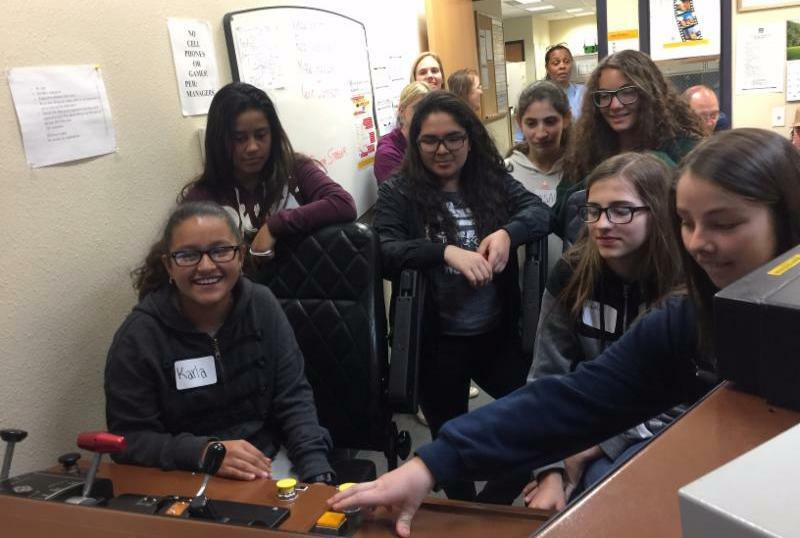 Leslie Blomquist, Mary Pool, and Freida Morales with the City of Citrus Heights thought it would be appropriate to familiarize the girls with the potential need of improvement and discuss the issues at hand. The girls were able to survey the site, provide insight on the problematic areas, and then verbalized solutions to help mitigate the traffic congestion. The girls then tested new waters by boarding a public bus to take them to the new Citrus Heights City HallBuilding and Parking Facilities. There they were able to see and learn about the design benefits to having a green parking lot. The terms permeable surface, bioswale, and rain garden have now been added to their engineering vocabulary! Citrus Heights staff opened their doors and allowed the ladies to tour the state-of-the-art facility. Leslie Blomquist, the traffic signal & operations supervisor, gave a personal tour of her office and "wowed the crowd" by debuting the technological side of her job. She was able to navigate to specific intersections with her camera monitoring system and show the girls just how she manages the traffic signal system to ensure safe and efficient operations. The day ended with the girls marking up aerial maps of their school site with the problem areas identified earlier and revisiting solutions for a smoother and safer traffic flow around the school campus. Lunch along with Q&A with the City staff was the finale to their day spent with WTS Transportation YOU. Huge thanks to the City of Citrus Heights and all their dedicated staff for their warm welcome and attention to Sylvan Middle School. 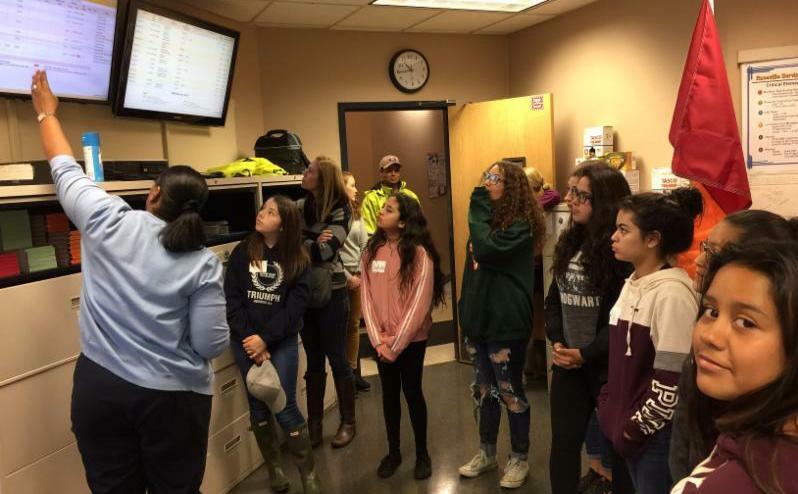 On November 5th, thirteen vivacious young ladies from San Juan High School were selected to attend a tour of the Teichert Materials Perkins Plant as a part of Transportation YOU. Teichert had the girls captivated early on in the day where they each made their own small batch of concrete to take home. Michelle Cunningham, Engineering Process Project Manager, and Mike Cunningham, Regional Operations Manager, led the students on an extensive tour of the facility and guided them through the step-by-step journey of the plant. Boots were dusted off after visiting the mining operations where then the tour continued by following the miles of conveyor belts carrying the aggregates to the processing plant. Questions from the students were answered as the trip advanced to the asphalt plants, ready-mix plant, and the QA lab where concrete cylinders were tested for strength and broken. The young ladies were astonished by the broad range of career opportunities offered at Teichert. They had the privilege of meeting and examining the roles encompassed by the GIS Analyst, Mining Engineer, and Biologist. To top things off, Mary Rotelli, COO, gave an inspiring speech to these young women interested in entering the transportation industry and provided the history behind Teichert's name. The WTS Sacramento Chapter is appreciative of all the efforts lead by Teichert and their staff for donating their day to these students and their aspiring futures. On April 2, the Sacramento Regional Transit District (RT) hosted a tour for the WTS Sacramento Chapter's Transportation YOU students. Ten young ladies from the New San Juan High School were selected to ttend based on their aptitude in math and science. Transportation YOU was formed in a collaboration between WTS International and the United States Department of Transportation as a hands-on, interactive mentoring program that offers young girls aged 13-18 an introduction to a wide variety of transportation careers. The program encourages educational courses in science and technology and offers programs and activities to spark the students' interest in a career in the transportation industry. 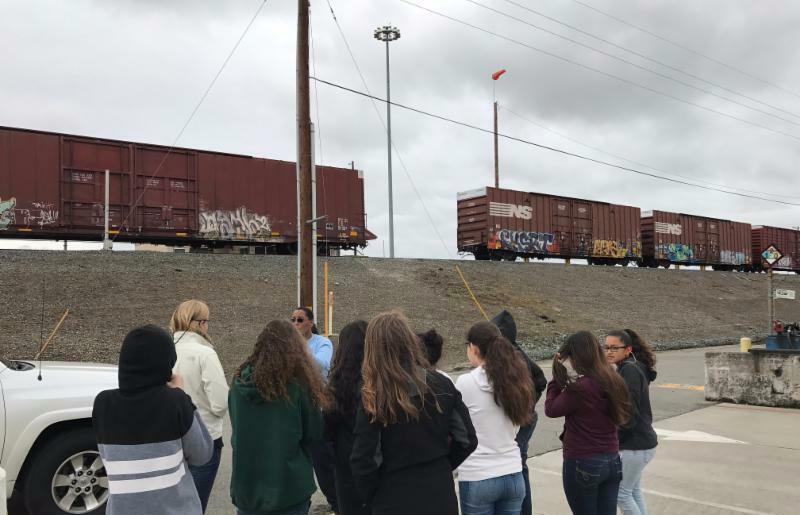 The New San Juan High School students' daylong visit began with a brief outline of RT operations that included a trip to RT's Light Rail Maintenance Facility, a tour of the Blue Line construction site, and an overview of RT's Planning Department. Laura Espinoza, Light Rail Maintenance Supervisor, led the RT Light Rail Facility tour. Diane Nakano, Assistant General Manager of Engineering and Construction, conducted the tour of the Blue Line with an overview of engineering at RT. RoseMary Covington, Assistant General Manager of Planning and Transit System Development, offered an overview of how the RT system is planned. All elaborated on their roles at RT, giving the students a better understanding of public transit operations. The tour was an excellent opportunity for the young ladies to ask questions of professional women who are leaders in their industry. When asked at the beginning of the day what their thoughts were about transportation, responses were hesitant. When asked at the end of the day if the students could see themselves in a transportation career, responses were enthusiastic and questions were abundant. The WTS Sacramento Chapter is deeply appreciative of the RT women who spent a good portion of their day with our Transportation YOU students, including Alane Masui and Connie Garcia who planned the tour. On Tuesday, April 10, 2012, WTS Sacramento's Transportation YOU program continued with a tour of the new Sacramento International Airport. The group of female students from the School of Engineering and Sciences who are participating in the program had the opportunity to view both the landside and airside portions of the airport and to hear from women transportation professionals who are involved with airport planning and operations. Assisting in the day's activities were Julie Car, Environmental Planner/Biologist with the Sacramento County Airport System; Karen Doron, Communication and Media Officer with the Sacramento County Airport System; Monique Hawn, Superintendent with Turner Construction Company; Kristi Hogan, Transportation Associate Vice President with AECOM; Kelly Moulton, Airport Planner with the Sacramento County Airport System; Stephane Parsons, Director of Biological Resources and Land Management with ESA; Sheri Thompson-Duarte, Operations Manager with the Sacramento County Airport System; and Jennifer Wehling, Director of Sustainability with LIONAKIS. Thanks to all for making the tour a great experience for the students! Students participate in a hands-on activity with help from Stephane Parsons. For the 2012 video and Summit Synopsis visit the Transportation You Info site: http://www.transportationyou.info/dc-summit/. 2013 Summit: June 26 - June 30, 2013. Keep checking the Transportation You Info site above for application instructions. A group of WTS Sacramento representatives met with 16 college-focused students. Speaking to the students about the types of varied careers available within the transportation industry were Celia McAdam from the Placer County Transportation Planning Agency, Rosemary Covington from the Sacramento Regional Transit District, and Lisa Pereira McClintock from Mark Thomas & Company. The kick-off was organized by WTS Sacramento Board members Julie Passalacqua and Jennifer Elwood, who also participated in the day's activities.